Teach your horse to pick up and hold his own feet: How do you pick up your horse’s feet? Do you pinch the tendon at the fetlock to get him to wince just enough for you to grab his foot and pull it up? And then do you have to stand there, bent over, holding up that foot? Wouldn’t it be nice if your horse picked up his own foot and handed it to you, and then held it up himself? 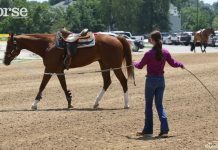 Stand at your horse’s shoulder, facing the hindquarters, and lean down as though you’re going to pick up your horse’s foot. Put your hand on the chestnut, then snap your fingers (or whistle or whatever signal you’d like to teach your horse) and lightly grasp the chestnut. Continue holding the chestnut, even getting a pretty good grip on it, until your horse makes the slightest try at picking up that foot. The instant he tries, let go. Repeat the process. The better your timing gets at the release, the sooner your horse will understand what you want. After several times of accepting the slightest try, begin to ask for more effort, always starting from the beginning. If he puts weight into the leg, let the foot go and start the whole process again. You could spend the whole 10 minutes on one foot each day and by the end of the week, your horse will pick up his feet at the snap of a finger! Great Article! My horse has been having trouble picking up her feet, she would only let me pick up one foot at a certain time. But i think this will solve the Problem. I love these tips. I am always looking for ways to improve my horse and rider relationship. This is such a great idea! Can’t wait to try it. This is sooooo simple! 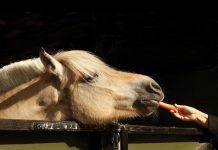 Horses will react to released pressure by picking up their foot. Simply amazing! THIS WORKS!! I used it with a horse I’d been training. No one had been able to pick up his feet before but I did this with him and BOOM! He’d pick his hoof up in a heartbeat. My farrier taught me this trick. This idea works very well because squeezing the chestnut on a horse’s legs will do something to the nerves that will MAKE your horse pick up his hoof. It’s kinda like when the doctor hits your knee, it’s an automatic reaction. I get both of my horses to pick up their feet, simply by sliding my hand down their leg, i don’t even have to squeeze their chestnuts anymore. My name is Rocio and i dont really have a comment. But rather a question. I bought bear a year ago. and he had no problem picking up his feet. Now that i have him home he doesnt want to do it. he will lean on the foot i need to clean. Is there any way you can give me some advice on how to get him in the swing of things again. He needs his feet done or he gets a white mark on his feet. and im so worried that there going to go bad. when i come around to sweet peas hooves she just lifts them up-just the fronts but its pretty cool. i bet this would really work!! i’m going to try all these tips. thanks pat. The article and comments were helpful. I bought this 8 yr old paint TWH. When I first got him he would pick up his feet, pretty well, but now he refuses and stomps it back doe hard like he wants to paw me. He is a very nervous horse and had issues with taking the halter on and off. I think he must have been beaten at one time . I keep trying to pick his feet up hoping he will give in, but he quickly slams them down. My husband is afraid he will strike me. He knows what to do, he just refuses. I just touch my horse’s fetlock and say, “Pick up your foot,” and he does. He even picks up the next foot in anticipation but I still have to hold it. I can’t imagine a horse holding the hoof up all by himself. That would get really tiring for him.